With its peculiar, sausage-shaped fruit and blood-red, tulip-shaped flowers, the sausage tree Kigelia africana (also Kigelia pinnata) is a striking standout. It is native to tropical Africa, where it grows in open woodlands, along riverbanks and streams, and in floodplains. The trees take advantage of the alluvial soil in areas that flood periodically, a location where other trees do not do well, and where they are protected from herbivores for some part of the year, giving them a chance to regenerate. Sausage trees are fast growing in the right conditions and can reach 50 feet in height. Baboons are one of the species that will dine on sausage tree fruit. Semi-deciduous with flaky, brown bark, these trees are mature at four to six years and flower from winter to early summer. The flowers are large and dark red with yellow pistils and stamens, and they grow on long, pendulous, rope-like stalks that hang down below the main crown of the tree. This makes them easily accessible to their main pollinators: bats, sunbirds, and insects. The flowers produce a large amount of nectar to tempt pollinators, but that also makes them a treat for other animals, including antelope and baboons. The scent the flowers produce is unpleasant to humans, but that doesn’t seem to deter other primates from snacking on them. The tree’s fruits are its most flamboyant feature. Dangling in clusters from long, pendulous stems, each thick-skinned fruit can get to be 3 feet in length and weigh up to 30 pounds! Attention should be paid when walking under these trees, to avoid getting beaned by falling fruit torpedoes. Some animals eat the fruits, but unripe fruit is poisonous, especially to humans. To make them edible, people bake them and slice them to eat the cooked pulp. The seeds are roasted as well, and can be a nutritional resource, since they are energy rich and contain essential fatty acids. Sausage tree leaves also have a nutritional benefit and have been compared to green, leafy vegetables like spinach, containing minerals like calcium, magnesium, and iron. 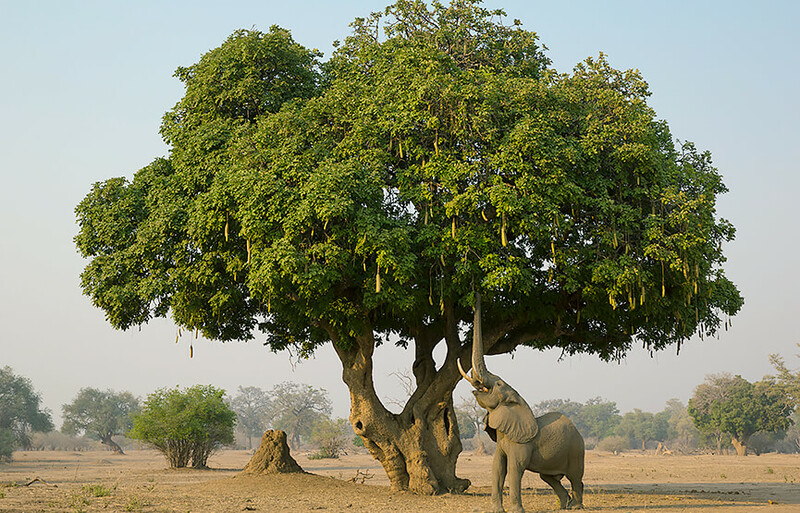 Elephants and kudu eat the leaves, and people dry the leaves and eat them as well. They are also used to feed livestock. Sausage trees are popular trees to plant along streets in South Africa, since their spreading crown of dense, leathery, glossy foliage provides shade. The wood of the trunk can be used for lumber, but it is soft and therefore not favored for construction. However, for thousands of years people living along the banks of large rivers have used the huge trunks by hollowing them out to make canoes. Cooked sausage tree fruit is a common ingredient used in making traditional African beer; it is said to increase the speed of the fermentation process. 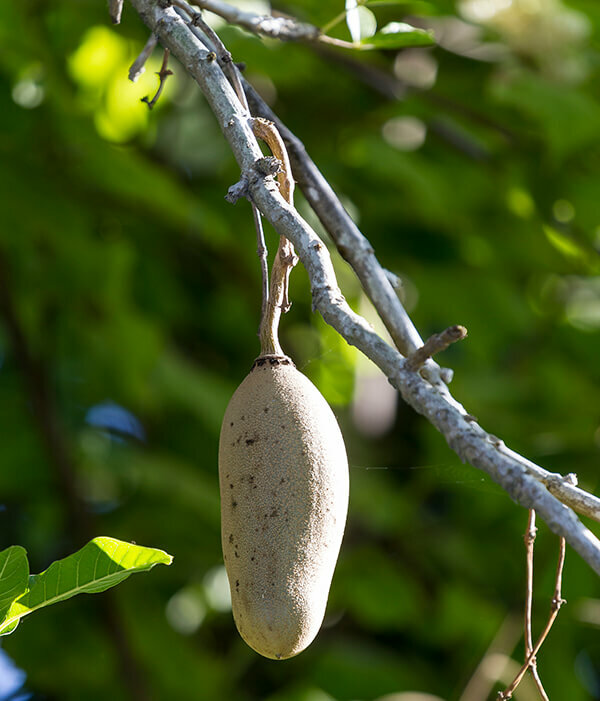 The fruit and leaves have also been used for a wide variety of medicinal purposes, and legend has it that if people hang the fruit in their houses, it will protect them from storms and hurricanes. Not surprisingly, considering the appearance of the fruit, it is also considered a symbol of fertility. 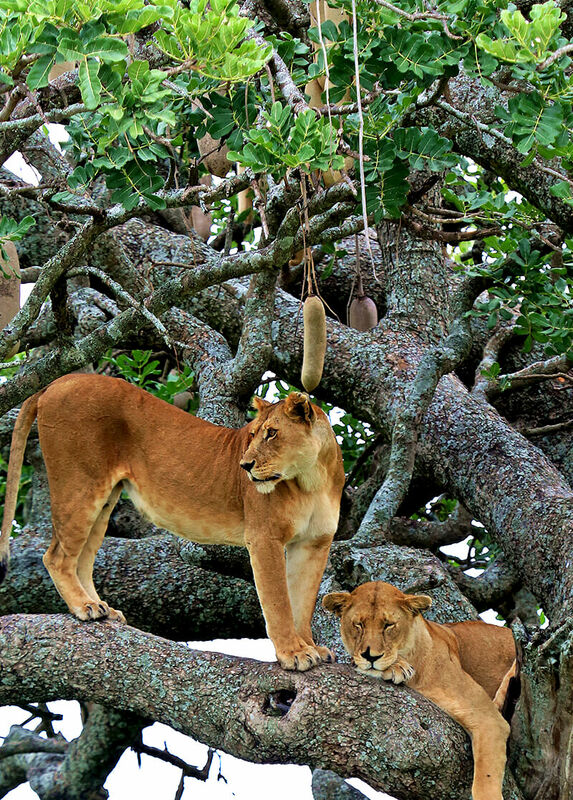 You can find this distinctive African tree at both the Zoo and the Safari Park. At the Zoo, look for several sausage trees along the pathway between the bonobo and gorilla exhibits in Lost Forest. At the Park, there is a large sausage tree at the beginning of the African Outpost area, after you go past the okapi exhibit. Sausage tree wood is used to make an African xylophone instrument. The sausage tree flowers bloom mainly at night, to attract night-flying bats as pollinators. Tonga women of the Zambezi valley use treatments of dried sausage tree fruit as a facial cosmetic to keep skin smooth. Dried whole sausage tree fruits can be used as firewood in a pinch—they burn well because of the oil content in the seeds. Sausage tree seeds germinate better after being stored for a year, probably because the tree sheds the fruit before the seeds are fully mature and they continue to develop on the ground.